Crisp and tender buttery Mashed Potato Pancakes are the perfect start to your Thanksgiving holiday! Made with just a few basic ingredients and ready in less than 20 minutes. Because “delicious yet easy” is my holiday motto! I’m approaching my last week of this month long amazing experience that started in Tuscany with a food photography workshop and stretched through this beautiful country’s most important cities: Milan, Parma, Firenze, Siena, Rome, Sorrento, Positano, Amalfi and we are on our way to Venice. To say I’ve eaten very well (and gained a “few” pounds) is an understatement. I’ve had my fair share of pasta and pizza and gathered a lot of inspiration – as well as some recipes – for future blog posts. But the thing is… I hate to confess this, but I need a break from Italian food! ??? I know, I know… You must be thinking I’ve got some nerve to say this on a food blog! No need to send help yet, as my love for Italian food is intact. I am just craving good old comfort American food and dreaming of these Mashed Potato Pancakes that I made for brunch the weekend before I left the States. Can you blame me? They are so delicious! This recipe has been my favorite way to use leftover Thanksgiving mashed potatoes for a while now. But what does one do when craving Mashed Potato Pancakes and there are no leftover potatoes? Or if it’s Thanksgiving morning and you haven’t started preparing the feast? 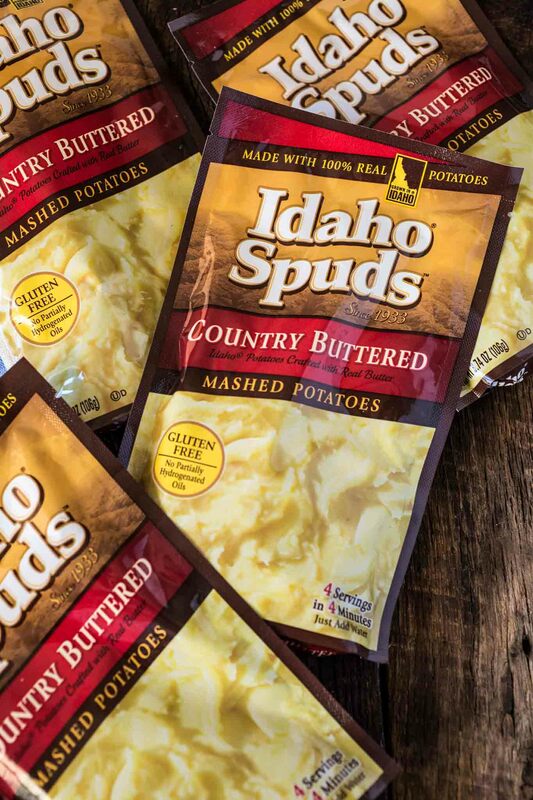 Thank goodness for whoever invented Idaho Spuds Flavored Mashed Potatoes. Simple, quick, foolproof and downrightdelicious! Just add water and you have amazing, fluffy mashed potatoes. 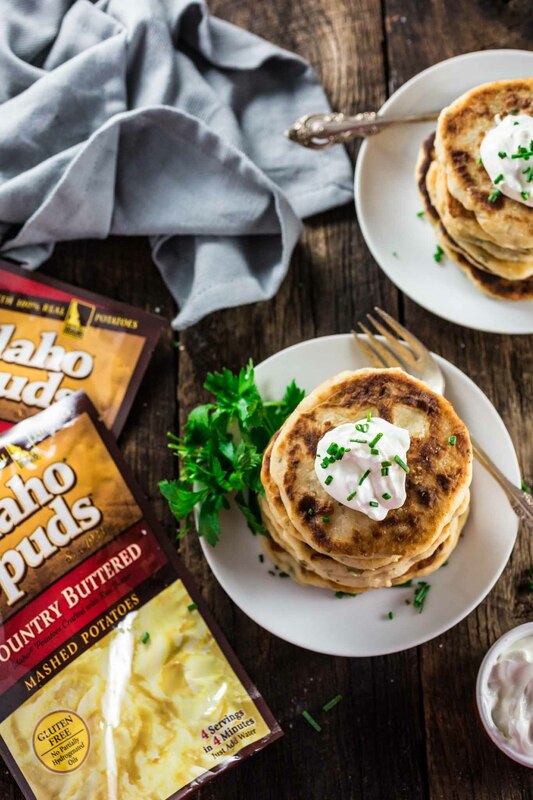 Yep, Idaho Spuds is definitely this lazy girl’s dream come true! Not to mention, it is made from 100% real Idaho potatoes, so I don’t have to compromise on flavor. For this batch of pancakes, I used the Country Buttered flavor, but any of the other 4 flavors (Roasted Garlic, Supreme Baked, Three Cheese or Creamy Ranch) work as well. Now, there are lots of Potato Pancakes out there. The most popular are the German version, often served with apple sauce, the French version, which is crisp and thin and omits any fillers and the Jewish version, which uses matzah meal and is always a hit for Hanukah. All of them use grated potatoes. I consider the mashed potato version to be the American version, but it is also associated with English and Irish cuisines. Whichever cuisine you choose to attribute this deliciousness to, you should definitely give it a try. I guarantee it will become your family’s new holiday tradition! Once you try these Mashed Potato Pancakes as is, chances are you will have ideas to customize it to your likings. I like to add different types of cheese, bacon, ham, or – my favorite – prosciutto! If simple is your thing, a dollop of sour cream or butter will suffice. You can also serve them as a side or even as a main dish, accompanied by a light green salad. As for me, I like to have it for brunch on Thanksgiving morning, to set the mood right for all the delicious things I will eat. It is definitely the breakfast of champions, but without having to peel, cook and mash a bunch of potatoes. P.S. Don’t forget to enter to win a luxury getaway to Shore Lodge on beautiful Payette Lake in McCall, Idaho, sponsored by Idaho Spuds! 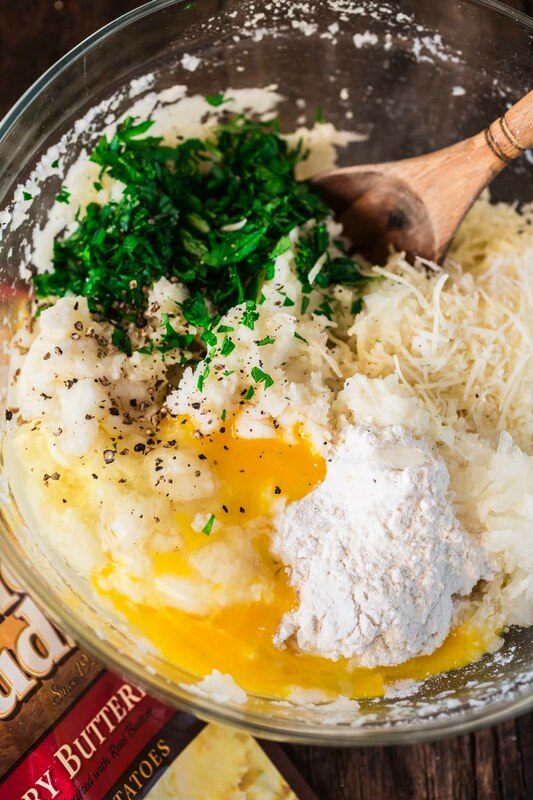 In a large bowl, combine the mashed potatoes, parmesan cheese, onion, 1/4 cup flour, egg, garlic powder and parsley. Season with salt and pepper and mix well until smooth. If the mixture is too thin, add more flour, 1 tablespoon at a time, until you can mold it into balls. Do not overdo it, as we are after soft, melt-in-your-mouth pancakes. Roll the dough into balls and flat them into 1/2-inch-thick pancakes. Add the remaining flour to a plate and dredge each pancake in the flour. Heat 1/4 cup of oil in a skillet over medium hear and fry the pancakes, in batches, until crispy and golden brown, about 3 minutes per side. Add more oil as needed. Transfer the pancakes to a paper towel-lined plate to soak up any excess grease. 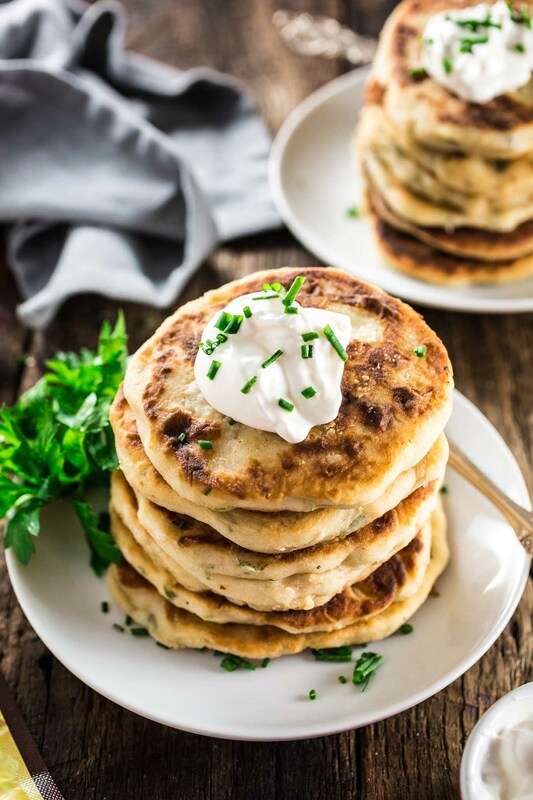 Serve the mashed potato pancakes immediately, topped with sour cream and chopped chives or scallions. 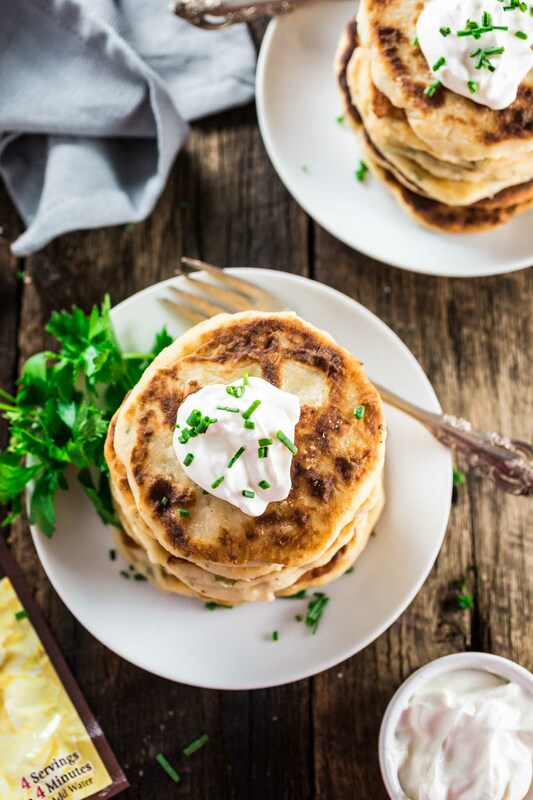 In Scotland they are called Tattie Scones and are normally eaten in a breakfast sandwich with fried egg and bacon or on a traditional Scottish breakfast.